Pirelli will participate in the 2013 Dakar rally as technical partner to Team HRC, fitting the Honda CRF450 Rally bikes ridden by the three riders Helder Rodrigues, Javier Pizzolito and JohnnyCampbell with Scorpion Rally tyres. 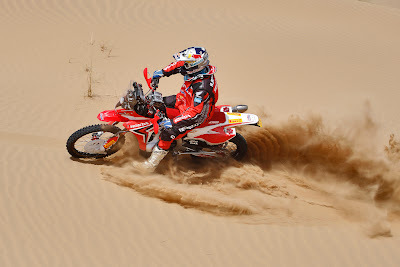 This year, the prestigious and now legendary Dakar raid will start on 5 January from Lima (Peru) and will end on 20 January in Santiago (Chile) after completing a route containing 14 legs and spanning Chile, Peru and Argentina. For the bikes, this means a grand total of 8,423 kilometres, 4,277 over normal roads to reach special trial tracks or the bivouacs at the end of each leg and 4,146 kilometres on special timed trials which will determine the competition standings. 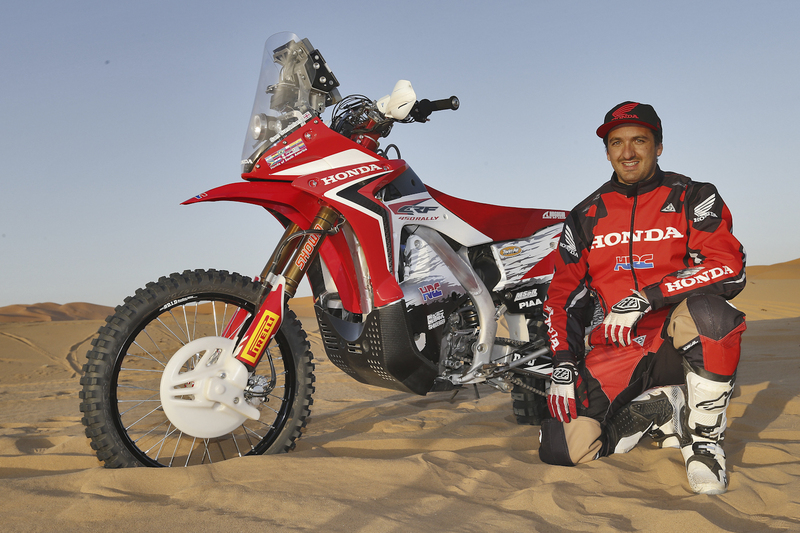 For the Dakar rally, Pirelli is making 2 front and rear versions of the Scorpion Rally tyres available to Team HRC. 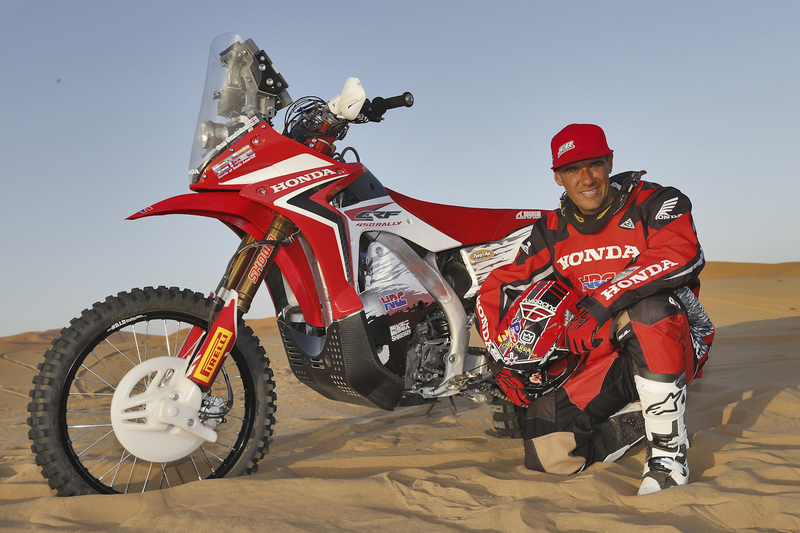 The rear size of 140/80-18 was selected as the best rear rally tyre by Honda, and the front size of 90/90-21, which is absolutely unrivalled in terms of performance on hard terrain. So Team HRC and its riders, with the assistance of on-site Pirelli technicians, will be able to choose the best solution depending on what type of leg the riders are racing. During the tests conducted in the Autumn in Morocco and California, Pirelli was able to confirm and even strengthen the rear specifications and, thanks to the valuable feedback from the riders and the team, the company with the long "P" was able to turn its attention immediately to the front tyre, improving performance in record time. During the tests, Pirelli worked to improve the tyre on sand whilst maintaining the excellent hard terrain performance which has always defined it. For this purpose, the engineers from the Milanese manufacturer worked mostly on the tread pattern, changing the layout of the knobs, where needed, in order to guarantee better line holding and better floating on sand. Scorpion Rally is the Pirelli product which is dedicated to raids and has been developed over decades of participating in various off-road competitions on all types of terrain, from soft sand to hard rocks. The success of the Scorpion PRO in the enduro classes, the multiple world titles won by the Scorpion MX, and the introduction of the Scorpion XC in cross country competitions have made Pirelli a household name across the world. It took several years to develop the Scorpion Rally tyres but, in the end, taking advantage of vast know-how and the most demanding testing environments, Pirelli engineers have introduced innovative solutions for off-road competitions and, once again, Scorpion Rally tyres are ready to surge ahead through the courses of these legendary competitions.